The following is a guest post from Lisa at Shopping Brake. Motivated by a challenge from her husband, Lisa is a shopaholic who is tackling her overshopping and overspending habits head on. Her blog is dedicated to providing personal insights during her journey to change her shopping habits. NOTE: This post marks the beginning of the new “Stories of Recovery” series which will appear periodically on the blog. 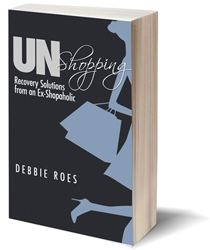 In this series, other recovering shopaholics will share their stories of how they’ve been able to overcome their shopping and wardrobe challenges in their own unique ways. I look forward to sharing diverse recovery stories that will help inspire and empower my readers. 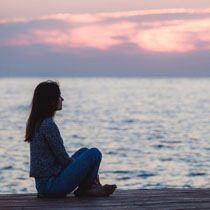 If you would like to be profiled in this new series (you can be anonymous if desired), or if you have an idea for another type of guest post on “Recovering Shopaholic,” please connect with me to share your thoughts. I don’t know why I am here and I don’t care. I just want to feel beautiful, happy, and loved. So I tear through the racks, a woman on a mission. If I can only find that perfect pair of jeans, and then the perfect top to wear with them, and finally the perfect pair of boots to round out my outfit, I will purchase it all, and then I will be that woman. The woman who is not me at this present moment in time… I will become a new woman, and she is perfect, because she is not me. Do you shop to try to become someone else? Wandering through the brick and mortar stores without a list, without a budget, and without any predetermined limits, that was me for many years. My closets were stuffed, my mornings were stressed, my wallet was empty, and my husband was lonely. I would visit the shops to cheer me up when I was feeling down. I would go to the stores as a ‘treat’ to celebrate working extra hard at my job that day. I would visit a store because I liked their location relative to my house and I wanted to support the business. I would stop by a store just to browse because I was bored, or wanted exercise, or was lonely. State a reason, any reason, and I could come up with an excuse for why I was in a store. Within those walls I could become any one I wanted to be, as long as I purchased the perfect items. And purchase I did. Again, and again, and again… I purchased so much and so often, the sales associates knew me by name. I could tell when a display on the sales floor was new, eyeball from across the floor what new merchandise has come in, and I could assemble a new ensemble for any style, at the drop of a hat. Today I am in my 5th month of “The DH Closet Challenge.” Over the years I have tried many different tips to curb my shopping and reduce the size of my wardrobe. And while they have all been helpful, it wasn’t until my husband came up with a challenge for me (which we’ve called “The DH Closet Challenge” – read why I’m doing it and the challenge rules), that I am now able to shop smarter and shop less. In the past 5 months, I’ve been able to purge bags of clothes, instead of merely one or two items at a time. I can go into a store now and walk out with only one item purchased. And sometimes I even walk out empty handed. I spend more time with my husband and less time getting dressed in the mornings. And I can fit my four season wardrobe into one walk-in closet. Since I’ve begun working on changing my habits, every day I look inside my closet and I am amazed at how cohesive my working wardrobe looks. I sit on the floor and look up and marvel at the small number of clothes that I have, even after five months and two seasons of doing the challenge. And then I visit “The Boutique” (my version of what Debbie calls “wardrobe benchwarmers”) and I sit on the floor again, this time hugging my unworn clothes as I browse. I want to wear all of my clothes, all of the time. I want my free time back. I want to make smart purchases. And I want to save money and use it wisely. I still have a long journey until I have no more extra items in my wardrobe and I truly do wear ALL of my clothes. But I can confidently say that after many years of struggling, I am finally walking down the right path on the road to recovery. Read more insights and observations from Lisa as she navigates “The DH Closet Challenge” at her blog, Shopping Brake. If you’ve only had ONE emotionally upset shopping trip, Dottie, you’re doing better than most of us! I think that as I get to understand my wardrobe and what works and what doesn’t, I will shop better even in heightened emotional states (but I’ll still try to stay away from the stores during those times). I love Lisa’s “boutique” concept and the learning she’s getting out of it. She’s really seeing how little she truly needs and I can see how her wardrobe is really coming together as she shops less and learns more! Yes, just one — in more decades than I care to divulge. Emotional eating (or, more likely, NOT eating) — now I could write pages about that!!! I guess everyone has a bugaboo. I have several bugaboos… The eating issues (like you, mostly NOT eating) have been a much larger factor in my life than the shopping issues. I actually started shopping MORE after I got my eating disorder more under control. I guess I never really dealt with the underlying issues. Still need to do more of that! I’m glad you commented, Mo, as I know you’ve been following Lisa’s journey over at YLF. If you wore 3/4 of your closet regularly, you’d be doing FAR better than most women, as most women only wear about 20% of their clothes on a regular basis. I love Lisa’s “DH Closet Challenge” and did something similar myself after my first stint of Project 333. I had only my 33 garments in the closet last April through June and then only brought other items back into the closet after I wore them. It was quite enlightening to see how little I really need! I totally shop to become the fabulous person I envision. Thanks again for the guest post Debbie! You’re welcome, Lisa! Thank YOU for doing it! I really liked this post, thank you to both Lisa and Debbie for sharing. I think many of us can empathize with that feeling of shopping in order to become someone else, whether that goes to the extent of being compulsive or not. Normally I rarely shop for sport (now that I know the damage most clothing does to the environment and the people making it, a lot of the appeal has died for me. And now that I’ve avoided them for so long, I really notice that a lot of retail environments that are aimed at my age are totally unappealing – loud and crowded, with no attention to detail) but lately I’ve found myself looking for new clothing for those reasons – to become someone else. A break up and some questioning of my degree has really made me feel like ‘becoming someone else’ sometimes, and I have to catch myself and remind myself that this is why I’m feeling the urge to buy, and that in fact it won’t solve any problems. Definitely something I’m still working on! On another note, I think the idea of having a “Boutique” and a working wardrobe is such a good way of distinguishing between what is really valuable and useful in your closet and what isn’t adding anything. Great idea from your husband, Lisa! Thanks for your comment, Emma. I’m sorry to hear about your break-up and the questioning you’re doing about your degree. I hope that you will come out of these hard times much stronger and wiser. I enjoyed the post you referenced and loved how you were being very introspective during a difficult phase for you. I enjoy reading introspective posts, so I guess I can understand why the posts I write in that vein are so popular… I like Lisa’s “boutique” concept, too! Her husband is a wise man. I can see that Lisa is really developing a workable wardrobe that will serve her far better than the overshopping she did before she took on her husband’s challenge. Thanks for this great post Lisa and Debbie. I can totally identify with all you said. I still have a way to go before I get to where I don’t want to buy buy buy, but I will get there. I’m glad you liked the post, Kim. I can identify with what Lisa wrote, too. Like you, I still have a long way to go, but we both will get there! Lisa, Thanks so much for sharing you story with all of us! I hope that lots of readers click over to view your blog to read more about your journey. You have made SO much progress in such a short period of time! Your husband is a smart guy to come up with your closet challenge… I look forward to seeing how things progress for you in the coming months! I’m very excited to have started the new “Stories of Recovery” series on the blog and I’m grateful to Lisa for kicking it off. 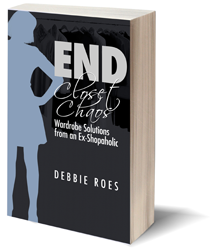 If any of you who are reading this would like to share your story (about how you changed your relationship to clothes and shopping or how you have transformed your wardrobe and closet – the scope is really quite broad! ), please contact me. I would love to share at least one new story each month to help keep people inspired. I’ve also been trying to nail down WHY I shop; but I’m not getting very far on it. I can come up with a handful of reasons… Is that normal? I live in a small place, too, Chelsea. When I did Project 333, I put my excess clothes in under the bed boxes and plastic bins and pushed some of them over to the extreme left and right sides of my closet (out of sight, out of mind). The “boutique” concept is useful and perhaps something you might consider in the future, but you seem to be doing well on your current path for now. Keep moving forward one day at a time. It takes time to change, but you’re making progress and will continue to do so! Oh yes, sitting down and looking at a spartan wardrobe or drawer and knowing that you will wear every single one of those items and enjoy wearing them is an amazing and exhilarating experience. I’m one year in and can’t believe how much better I feel for purging and how much easier it is to shop. Firstly, I enjoyed this article and am very excited about seeing more similar articles! They don’t prompt the discussion that other posts do, but I would love to be directed towards others going through / been through the same situation! I’m familiar with Lisa and read her blog- can’t wait for more posts of hers! I enjoy Lisa’s blog, too, Meli. I’m glad you like the new series. I agree that these types of posts don’t necessarily inspire as much discussion, but they are inspiring in a different way. Don’t worry… I will have some discussion-provoking posts again very soon! Thank you Lisa! I enjoyed your guest post here, and I’ve read your blog, and I’m cheering for your success. I went through a similar process a few years ago, and I know your posts will help many people accomplish similar goals. Now that I (finally!) have a small collection of clothes I enjoy wearing regularly, I agree with Gillie – it’s a WONDERFUL feeling. I’ m glad you liked Lisa’s post and are also enjoying her blog, Terra. I know you have experienced similar success and can relate to both Lisa’s and Gillie’s journey. I would love to feature your story in this series, too, if you’re willing. I know that many readers have shared their success in the comments, but a lot of people don’t read the comments. I’d love to give some of the excellent stories a higher profile as featured blog posts. Let me know if you are game! Debbie, I’m willing. I remember how much articles like this helped me when I first began about 3 years ago. I read everything I could find. And then thankfully I found your blog which helped me connect to you and to others with the same goal. Yay, Terra! Thanks for your willingness to contribute to my “Stories of Recovery” series. I will be in touch… I know readers will benefit from your story!